Every year from March-October, the sandy beaches of Palm Beach County become essential nesting grounds for three different species of sea turtles, including the loggerhead, green and leatherback. The female sea turtle comes ashore at night to construct her nest on a dry part of the beach. It is here that she will deposit 80-120 eggs, which will incubate about 2 months buried in the sand. After emerging from the nest, hatchlings crawl down the beach to the water where they must swim for many hours to reach rafts of seaweed in the open sea. 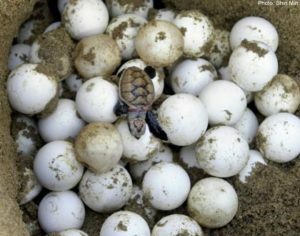 Roughly one quarter of all sea turtle nestings in Florida occur in Palm Beach County, making our beaches extremely important to the survival of these threatened and endangered species. Sea Turtles do not see well on land and light only obstructs their vision. Light is one of the major reasons that cause a mother not to nest. Light attracts hatchlings by the hundreds and prevents them from crawling down the beach to the water. Sea Turtles nest at night. Closing your curtains at 9:00pm insures that our turtles have a quiet place to nest and their hatchlings have a chance to start on a 25-year journey to return to our beach to replenish the species. Make sure chairs, toys and boats are off the beach from sunset to 2 hours after sunrise. Replace wooden cabanas with lightweight furniture that is easier to move on and off the beach. At night, beach obstructions should be placed as close as possible to the dune in an area that does not impact native vegetation. It is against federal and state laws to touch or disturb nesting sea turtles, their nests, their eggs, or their hatchlings. Sea Turtles lack the ability to easily maneuver around objects or crawl backwards, and although they have good vision underwater, they do not see well on land. Therefore, furniture and equipment left on the beach overnight may create an obstacle for nesting sea turtles. When a sea turtle comes in contact with an obstruction, she can become trapped or entangled and is more like to return to the sea without nesting.